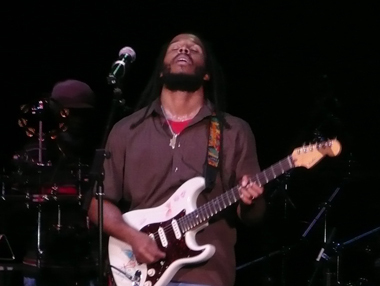 About a month ago I saw Ziggy Marley at the Yunfeng Theatre here in Shanghai. I love reggae music – used to be part of a reggae band, and I still write reggae songs for my blues band – but I didn’t catch a ticket for Ziggy for two reasons. First, because I didn’t want to spend the money. Second, because in the back of my mind I was thinking maybe it wouldn’t be – what’s the word here – genuine? There is a line of thinking that says Bob Marley was the best thing and the worst thing that ever happened to reggae. The best, obviously, because he put reggae on the map and became an international superstar. But also the worst, because he was so celebrated and triumphant, and in his untimely death became a lionized legend – and the thinking goes, no one will ever be as great as Marley again. Meaning reggae is doomed. Some say it has played out that way. The eighties were tough times for reggae. Despite the success of Black Uhuru, with famous rhythm section Sly Dunbar and Robbie Shakespeare (who played with many, many reggae groups), fewer and fewer people seemed to pay attention after Marley’s death. As the eighties became the nineties, and especially as we moved into the 21st century, reggae has been making a comeback on the strength of artists like Toots Maytal, Lee “Scratch” Perry, Burning Spear and Eek-a-Mouse. Bob’s oldest son with his wife Rita, Ziggy Marley first gained popularity as the leader of the Melody Makers, a band he formed with his siblings. That got old pretty quickly, however, and for the last few years he has been establishing himself as a solo artist. He came into Shanghai with a ten-piece band (including a Chinese-looking guitarist, who I’m not sure is a full-time member, two backing vocalists and himself), fresh off his success at the Grammys, where his recent album, Love is My Religion, took the award for best reggae album. During the show I took a break and caught up with some friends. In a circle of conversation there was a German guy I’d never met who agreed with me that the concert was going well, but complained that Ziggy was “just playing his dad’s stuff.” My first reaction was that Ziggy was splitting it 50/50 between his own and his father’s songs – and that was fine with me! They opened with a great Ziggy tune – I don’t know the name – which talked about the “children of Palestine” and right after that launched into a killer “Positive Vibration” that really blew the crowd up. Thinking about the German’s comments, I realized that had been my fear coming into this whole thing – that Ziggy’s music wouldn’t be genuine. That somehow it wouldn’t be a good concert. I suppose I had the image of the Melody Makers in my head. I was totally wrong. Ziggy brought some of Jamaica’s finest musicians to China to show us what Roots, Rock, Reggae is all about. As for critics’ complaints that Ziggy plays Bob’s stuff, my retort is: who else is more qualified to play it? And don’t the people still yearn for it? You bet we do. There were times when I doubted myself in this conviction. Ziggy’s lead guitarist played most of the show wearing a menacing screw face. He seemed to be thinking, I can’t believe I’m playing “Jammin” for a bunch of white kids AGAIN. But you know what? He doesn’t have to play in Ziggy’s band, does he? As a great man once said, Buy the Ticket, Take the Ride. And there was a special moment in the middle of a forbidden riddim when this same dude broke it down and started toasting over the beats – to the crowd’s roar. And when they did the epic “War–>No More Trouble” medley that epitomizes the struggle for justice in all the world, I was a full-blown Rastafarian shouting out the words of Haile Selassie himself as Bob had arranged them. It was a night the GRP should have celebrated together. Props are due to Dave Hoya for calling me up and saying, “I’m in line to buy tickets to Ziggy Marley and I’m getting one for you.” It was a lesson I won’t forget. Didn’t he and Lauren Hill have a kid? Reggae and Hip-hop unite.